Many people don’t think about the causes and effects of brain injury unless it has impacted them personally. Brain Injury Awareness Month strives to change that, and shed some light on the medical condition as well as prevention efforts. Traumatic brain injury is one of the leading causes of disability and death according to the Centre for Disease Control, so it’s imperative that people are aware of the risks, and how to protect themselves. With how common brain injury is, it is important that the sufferers of traumatic brain injury and their caregivers realize that they are not alone in their struggle. Brain Injury Awareness Month strives to de-stigmatize the condition through educational outreach and raising awareness of the condition. Through de-stigmatization it is hoped that those affected can grow to feel empowered in their lives, beyond their medical condition. 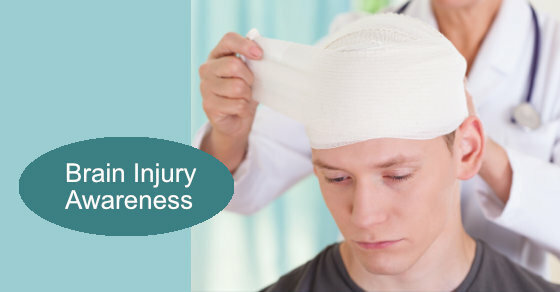 There are many different circumstances that can lead to traumatic brain injury, and each instance can cause different symptoms depending on the severity and location of the injury. By being aware of the causes, people can work to protect themselves, and avoid serious injury in some cases. Domestic or otherwise, assault can easily cause traumatic brain injuries. While many people immediately think of domestic violence and spousal abuse when considering assault, gunshot wounds are also included in this category. Disturbingly, assault is the most common cause of traumatic brain injury among children under the age of 5. Among people aged 65 or older, falls are the leading cause of traumatic brain injury. In 2013 alone, 75% of the reported cases of traumatic brain injury in the elderly were caused by falling. Fortunately, there is equipment available that can help minimize the risk of injury to the elderly. A trained medical professional can suggest the best equipment for you or your loved one and provide training in order to ensure the equipment, whether it be a stair lift or a cane, is used in the most effective way. In car accidents, traumatic brain injury is frequently caused by the head receiving a direct blow. Equipment like airbags and other safety features are designed to minimize these risks and prevent injury to the brain and the rest of the body. While direct blows are the most common cause of brain injury, it's important to remember that traumatic brain injuries aren't always caused by direct impact in car accidents. With conditions like whiplash, neck injury and pain aren’t the only things to be concerned about. When the head is jerked suddenly, it can cause the brain to move, damaging the tissue in and around the brain. In these situations, it is common for the nerve fibres in the head and the neck to become injured, which can affect how the brain communicates with the rest of the body. If the whiplash is severe enough, you stand the chance of receiving a concussion or even becoming comatose. Contact sports can prove to be dangerous, and it’s common to hear about an athlete receiving traumatic brain injury during a game on the news. While sports equipment is designed to minimize the potential for injury, they aren't always 100% effective. Sports injuries can result in either minor concussions or more severe traumatic brain injuries. Fortunately, there are many ways to help improve the lives of those who have suffered from a traumatic brain injury. After a moderate to severe traumatic brain injury, rehabilitation is usually needed to help the brain and the body to heal properly. This rehabilitation varies in intensity based on the level of injury received, as well as the progress that has been made after the injury. After the patient regains as much function as possible during the more intense levels of rehabilitation, outpatient therapy is used to maintain that progress and to perfect certain skills. In patients with relatively minor brain injuries, only outpatient therapy is needed to regain their ability to properly function. For long-term care, there are many types of medication that are used to treat the injury and its symptoms. These are used to treat both the physical and mental effects that can occur due to a traumatic brain injury. These sometimes continue long after rehabilitation services are completed. For long-term care, there are many other programs and therapies to help traumatic brain injury patients maintain the highest quality of life possible. Brain Injury Awareness Month aims to inform people that there is hope after a brain injury. Many people who have received a traumatic brain injury go on to live long, fulfilling lives with friends and family. The best course of treatment is to take the proper precautions and speak to a healthcare professional if you or a loved one is at risk. For more information about the prevention and treatment of brain injuries, contact Physiomed today.